If my new soccer mom friends hadn’t figured out I have some odd quirks, they probably know now. Over the past several weeks spring has finally arrived in full force, the dandelions are in bloom and the soccer practices have seemed to stretch on forever, as the coaches take advantage of the lasting evening light to train the boys. So, what does a bored soccer mom/photographer do? Why, take out the camera and experiment. And, if that means lying down in strange positions, in the middle of a patch of dandelions next to the soccer field, so be it. On this evening, I couldn’t resist taking out the Sony RX100 for some macro shots with the setting sun as a backdrop. After recent rains, the grass was finally dry, and the dandelions took advantage of a break in the mowing to flower and disperse seeds. While the boys kick a ball around a field for hours on end, I’ve discovered a wealth of photographic opportunities await, and I’m not afraid of getting down and dirty just like them. As a fellow soccer mom, I salute you! Why, thank you so much! It’s a great group to be in! Excellent photo Tricia…love the light!!! Funny…my next post is about getting down and dirty for a different perspective. Great minds! Gorgeous. All soccer moms should be so creative and fun! My daughter Laura called them “birthday flowers” She’d sing, make a wish, and blow the seeds off the dandelion head. Thanks for this beautiful photograph tonight. You are welcome, and what a sweet story! Good use of the time, soccer mom! 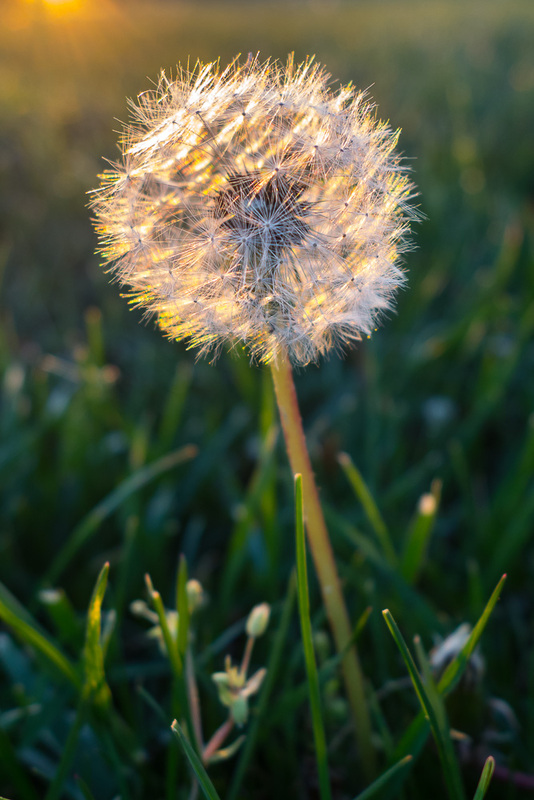 The picture of the dandelion is gorgeous with the back light. Thank you so much! With four+ hours a week at the field there’s lots of time to play with light! Fantastic shot of a dandelion to release her seeds on the wind. Like the evening light, and the color it brings.